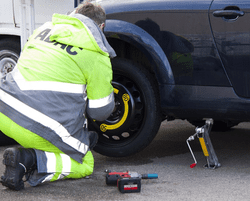 Getting a flat tire is a bummer but don't despair, we are here to help! We can change the tire if you have a good spare. If not, we can tow your vehicle to the nearest auto garage for assistance in getting a new tire or spare. Give Us a Call at (412) 888-0990 and we will send a professional service to get you back on the road as soon as possible.